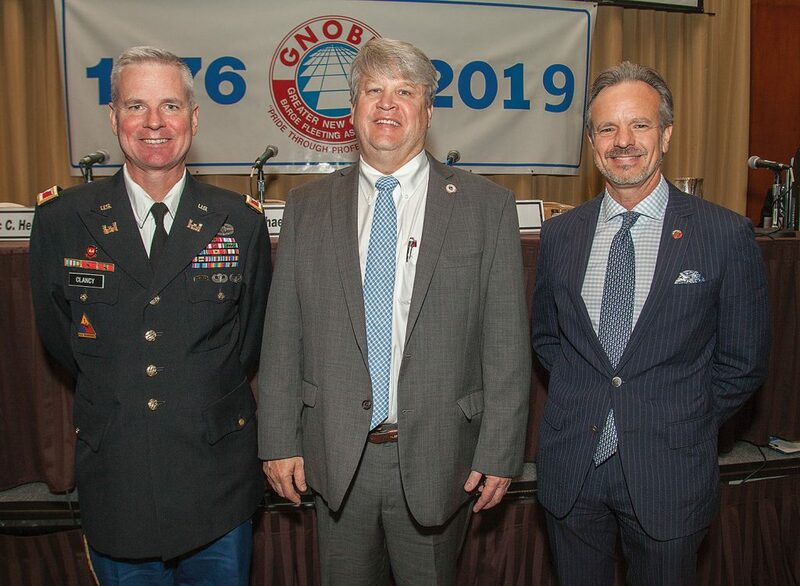 The 37th annual seminar of the Greater New Orleans Barge Fleeting Association (GNOBFA) was held at its traditional location, the Intercontinental Hotel in New Orleans. But it took place a little earlier than usual this year., being held April 2-5 instead of its traditional time in the last week of April. As Karl Gonzalez, vice president at Plimsoll Marine and president of GNOBFA’s governing board, explained, the GNOBFA committee moved the seminar back this year due to a conflict with the New Orleans Jazz Fest, which ran an extra day and monopolized hotel rooms due to its 100th anniversary. The highly-regarded maritime seminar will move back to its traditional time next year. Marc Hebert, partner in the corporate practice group at Jones Walker, moderated most of the panels, with help from Alan Savoie, director of marketing and business development for Cooper Consolidated LLC and a past president of GNOBFA, who as seminar co-director acted as “floor manager.” As usual, attendees were encouraged to ask questions from the floor. Marc’s dad, Maurice Hebert, a founder of the GNOBFA seminar, was seminar co-moderator; he retired from Liskow & Lewis in 2004 but retains his license for special projects, mediation and arbitration. The panel presentations were packed with substantive issues presented by industry and government experts. The topics of trade, infrastructure, the budget process in Congress and cybersecurity received special attention, along with a new topic: sexual harassment and how it might affect the maritime industry. Sugimoto said that being posted in New Orleans, by far the Coast Guard’s largest district in terms of traffic and tonnage, gave him an appreciation of the entire maritime transportation system. Looming large among those challenge is cybersecurity. Sugimoto noted that recently, for the very first time, Coast Guard cyber inspectors boarded an inbound foreign-flag ship and certified it “clean” of cyber threats before it was allowed to enter a U.S. port. Such boardings, he said, will become more common. 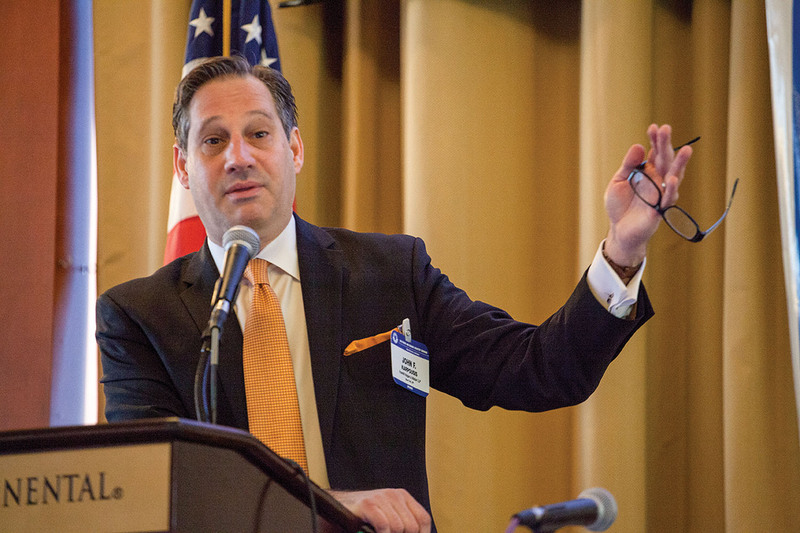 John Karpousis, a partner at Freehill Hogan & Mahar where he heads the firm’s workers’ compensation defense practice, began by noting that the Supreme Court is considering a landmark case that revisits the question of what lawyers call “chevron deference,” meaning the deference that Congress and the courts show to a federal agency in interpreting its regulations. Until now, agencies have been given broad leeway to interpret their own rules, but pressure has been building for a number of years for that deference to be restricted. Most of his presentation referred to a number of recent conflicting cases in different circuit courts over the question of who counts as a Jones Act seaman. The way has been left open for these splits by vague language in several previous circuit court rulings. Almost every term defining a “seaman” in previous rulings has been open to dispute and inconsistency. According to a Supreme Court ruling, Papai v. Tug & Barge, written by the late Justice Sandra Day O’Connor, a seaman had to have a “substantial connection to a vessel of sufficient duration,” which O’Connor interpreted as spending at least 30 percent of his time on the vessel. However, said Karpousis, this has not been a “bright-line rule” in other cases. Other judges have ruled that seamen must be “exposed to the perils of the sea,” but again, opinions differ over what that means. Can a dock worker be “exposed to the perils of the sea” in a moored vessel? This might be true of almost every longshoreman, even though their status is covered by a separate Longshoreman’s Act. Other judges ruled that seaman had to “go out to sea.” Fifth Circuit judges in particular, said Karpousis, tend to apply seaman status broadly. Karpousis said a whole host of cases have tried to define a vessel by type of hull. In Madison County, Ill., a judge ignored Lozman and ruled that a work barge was a vessel under Dutra. One commenter in the GNOBFA audience noted that a Sixth Circuit case had ruled that a spudded-down work barge was not a vessel. Another questioner commented that when lawyers and judges are split over who is a “seaman” or what is a “vessel,” juries are likely to decide cases based simply on whether they like a plaintiff or defendant. He said the Second Circuit has been more consistent than the Fifth. How can Dutra be reconciled with Lozman? The answer, said Karpousis, is that it cannot be. Karpousis said he is hoping the Supreme Court will provide clarity soon, because it’s very hard for marine businesses to manage risk or to plan under such basic uncertainty. In the meantime, Karpousis said he advises his marine clients to go through a checklist. Determine the nature and function of each vessel, the percentage of time each employee spends on a vessel, the type of job each worker is doing, his or her compensation status, and whether or not workers are entitled to file liens under maritime law. The next panel, given by tax attorney James Exnicios of Liskow & Lewis and Mariska Witt Roney, tax managing director at KPMG, was titled, “The Potential Effect of the ‘New Tax Laws’ on the Marine Industry and Its People.” What was clear from their presentation is that there are “lots of moving parts” to the new law, as Exnicious said. Exnicios briefly recounted the passage of the landmark tax bill, formally called the Tax Cuts and Jobs Act. He noted that its drivers were political. It was proposed and passed in a mere 47 days—“light-speed for Washington,” said Exnicios—with no Democratic votes when the Republicans controlled the House and Senate. It was signed into law December 22, 2017, and took effect January 1, 2018. It contained $9.5 trillion worth of tax changes, including $5.5 trillion in tax cuts, $4 trillion in tax increases and had a $1.5 trillion net impact on the deficit. It was “scored” by the Congressional Budget Office as providing a net tax reduction of $1.5 trillion over a 10-year period, and all the adjustments to the bill had to fit inside that cap. “This law really was a game-changer,” said Exnicios, who added that truly transformational tax reform happens only once in a generation. The last similarly sweeping tax changes happened in 1986 under Ronald Reagan. The final regulations comprised 250 pages of complex language, he said. Any tax bill this sweeping and enacted this swiftly, said Exnicios, has omissions and mistakes. Normally they are corrected in a “Blue Book” after they are brought to the attention of Congress by the various groups affected. The Tax Cuts and Jobs Act needs about 65 or 70 “technical corrections,” he said. It’s supposed to be a bipartisan process. But by the time the needed changes were proposed, the mid-term elections had left Democrats in control of the House “and they aren’t interested in helping Republicans fix a bill they didn’t help pass,” said Exnicios. Thus, the Blue Book for this tax law has still not been published. When Deloach asked whether marine businesses did better under the new law by incorporating or establishing separate LLCs for their businesses, Roney said there are so many variables that the only responsible answer is, “It depends.” Each business should consult its own tax professionals. The first panel after lunch was made up of judges from various jurisdictions. Judge Kurt Engelhardt serves on the Fifth Circuit Court of Appeals; Judge Jane Triche Milazzo is a district judge of the Eastern District of Louisiana; Judge Janis van Meerveld is a magistrate judge in the Eastern District; and Judge Barry Ashe is a new district judge in the Eastern District, having been nominated by President Trump January 8, 2018. Judge van Meerveld began by explaining the duties of a magistrate judge. They handle discovery disputes and settlement conferences in civil cases but cannot try felonies or issue warrants. Much of her time is taken up with settlement conferences, up to five per week, but about every fifth week is devoted to criminal matters. Magistrate judges work in consultation with district judges, to whom they get randomly assigned. Judge Van Meerveld explained that her heavy work schedule means that conferences must be to the point. In response to a question, she said her biggest pet peeve was opposing lawyers who don’t talk to each other prior to a conference. She often sees them working out a settlement in her chambers that could have been reached earlier. Similarly, Judge Ashe said he has a standing order that motions will be taken based on paper documentation rather than oral argument, even though a local rule encourages judges to allow oral arguments when requested. A circuit judge might decide that a lower court has abused its discretion. When asked for an example of abuse of discretion, Judge Engelhardt noted a case that was dismissed on appeal due to lack of discovery by the plaintiff. One questioner asked Judge Milazzo whether judges have the authority to set fees of expert medical witnesses. “Yes, although that’s never happened in my court,” she answered. She did, however, once issue a bench warrant to compel a doctor to appear as an expert witness (he was never found). Electronic discovery and third-party financing of litigation (which is only legal in some states) were also discussed. The next topic after the break was a first at GNOBFA: a presentation on the “Me Too” movement and policies to protect against sexual harassment claims. The panelists included plaintiff attorney Jill Craft of the Craft Law Firm in Baton Rouge; Michelle Butler, a senior trial attorney at the Equal Employment Opportunity Commission (EEOC) who had served as an assistant district attorney under Harry Connick Sr.; and Sidney Lewis, partner and practice group leader of Jones Walker’s Labor & Employment Practice Group. Craft discussed Title VII claims, in which an employee claims retaliation for reporting harassment. “I’m seeing hand-in-hand claims where the harassment part fails in court, but the retaliation part succeeds. Make sure your policies regarding retaliation are in place!” she advised employers. Butler pointed out that there must be an employer/employee relationship for the EEOC to become involved, but juries may not require such a relationship. Lewis noted that courts can take a liberal view of who is an “employee” in harassment and discrimination cases, often regarding independent contractors as such. “I’ve never met an ‘independent contractor’ who wasn’t really an employee for civil rights purposes,” he said. “Don’t limit your harassment policies to sexual harassment alone,” Lewis advised. He advised employers that when claims can’t be proven, if someone in the organization has to be moved, never move the complaining party, as this could be viewed as a form of retaliation. And never make the person bringing the complaint write it down before taking any action, he said. He said he is not a fan of policies that require complainants to report violations to their direct supervisor. In past years GNOBFA has had individuals give updates on developments in Washington. This year, an entire powerhouse panel took on that role. Members included Rep. Todd Rokita, who served as Indiana’s Secretary of State from 2003 to 2011 and represented Indiana’s Fourth Congressional District from 2011 to 2019. In Congress, he served on the Transportation and Infrastructure Committee. Rokita left the House to run for the Senate and returned to private consulting when he lost his Senate race. Other members included Rick Calhoun, former president of Cargo Carriers and a 41-year veteran of the grain and transportation industries; Liam Donovan, who handles communications at Bracewell’s for Associated Builders and Contractors; and James Adams, director of government relations for Jones Walker, who began his career as a Coast Guard officer. Adams began with a summary of the 2018 elections, which returned control of the House of Representatives to the Democrats. He noted with understatement the “huge gap in between views of the GOP leadership in the last Congress and the views of the Democratic leadership in the House,” and said the Democrats are in position to “move whatever they want in the House.” In the next election cycle, the Republicans have to defend 22 Senate seats, while the Democrats only have to defend 12. In the White House, Adams said the staff turnover has been “unprecedented” and is a major challenge for the administration. He said the White House has ‘not been disciplined” in advancing political appointees, even though in the Senate, Sen. Mitch McConnell has been laser-focused on getting Trump’s judicial appointees approved because he can control the confirmation process. Despite Democratic attempts to slow and delay judicial appointments, Trump, with McConnell as his Senate manager, has managed to appoint 93 federal judges—“a remarkable record,” according to Adams. Where the Republicans have been less successful is in the “second-tier” appointees, where Senate Democratic leader Chuck Schumer has been more successful in stringing out debate and using other delaying techniques. Taking advantage of rule changes partly created by Sen. Harry Reid, McConnell tried to speed up the process by exercising a “neutron” option. He changed Senate rules to allow a vote to limit debate to two hours by simple majority, instead of the former 60-vote requirement. Marc Hebert said the focus of the inland navigation industry must be on the House, since spending bills originate there and “lots of Democrats support our issues.” Adams agreed that infrastructure could be an important compromise area. He said that the president’s budget “used to be taken seriously” in Washington as the agenda of the party in control, but “there hasn’t been a serious presidential budget proposal in the past 14 years.” The budget states how big a pie is to be sliced; the action happens in the appropriations process, which determines the size of each slice. Rokita said that budget committees in Congress have been “emasculated.” Normally most of the 12 appropriations bills are passed by June, but Rokita said he didn’t look for that this year. “Governors of some states are still waiting for disaster relief money” from last year, he noted. He said the administration’s infrastructure proposals—which include tolls and the upping of the industry tax that contributes to the Inland Waterways Trust fund—are “dead on arrival” in Congress. The appropriations process is the way forward, even in a divided Congress, said. Rokita. The president’s budget is simply a wish list. Calhoun noted that Sonny Perdue, the secretary of agriculture, told him that the president’s budget often low-balls infrastructure because it knows that Congress will “fix” the spending numbers. Because of the breakdown in the budget process, the country could be facing another “fiscal cliff” again in September, he said. “Coalition-building is the only way forward,” said Donovan. In response to another question, Adams said this Congress will see more “significant” efforts to attack the Jones Act. He said there is significant sympathy for Puerto Rico in Congress, due to the devastation it suffered from Hurricane Maria. The fact that LNG infrastructure is being planned for the island gives it added clout. The anti-Jones Act push comes from oil companies and shippers that want more and more exemptions from the Jones Act. They are aided by libertarian and free-market think tanks like the Heritage Foundation and Cato Institute. He said that in a recent trip to New York, he noticed a billboard from the Cato Institute that read, “Stuck in traffic? Blame the Jones Act.” There’s even a website, blametheJonesAct.com. Gulf Coast conservative Republicans, whoever, remain strong Jones Act supporters, along with many Democrats, said Adams. 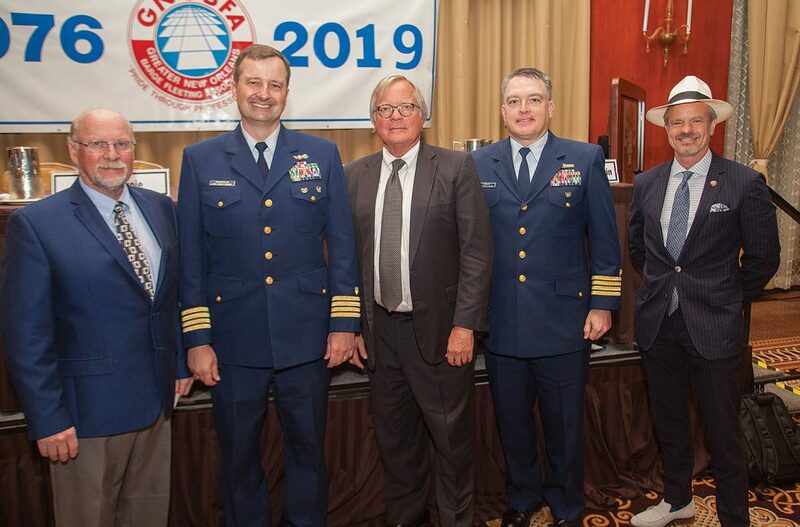 The next panel, whose full title was, “The Never-Ending Laws, Rules and Regulations Throughout the Marine Industry,” featured two former commanders of Coast Guard Sector New Orleans: Capt. Wayne Arguin and Capt. Phil Shifflin. Arguin now serves as chief of emerging policy at Coast Guard headquarters in Washington, D.C. The panel was rounded out by James Farley, senior vice president of Larkspur Consulting LLC in Texas, Marc Heber and Alan Savoie, who moderated. Arguin began by referring to a recently released Coast Guard publication, “Maritime Commerce Strategic Outlook,” that has already been the subject of meetings at the Brookings Institution and other venues. According to this report, world demand for waterborne commerce is expected to double by 2026—just six short years away. “As regulators, we can be the grease or the friction” in that growth, he said. He said the publication was designed to address the question, “How do we manage and benefit from disruptive innovation in the maritime transportation system?” No other country can match our system, which has a cumulative $5.4 trillion impact on the U.S. economy. Arguin said the Arctic is the next strategic arena for military and commercial positioning and rivalry between shipping nations, as warming opens up new sea routes. He said the Coast Guard has inspected foreign terminals and facilities to make sure they have adequate security features. It has been given a role on the newly set up Space Command. Cybersecurity is an area of emerging concern. But while the Coast Guard has issued a Navigation and Inspection Circular (NVIC) on cybersecurity for guidance, it has no new regulations of the field—yet. Shifflin explained the levels of legal force behind the various Coast Guard communications. A NVIC is a policy recommendation promulgated from headquarters. While it does not have the binding force of law, it does indicate how the Coast Guard interprets a particular regulation. “If you disagree with a NVIC, make your case to the local officer in charge of marine inspection (OCMI),” said Shifflin. “That’s your right, and I promise you that no one will look askance at you if you do. The policies of different OCMIs give the system flexibility but can give rise to question also.” He added, though, that if a captain of the port believes a NVIC addresses a safety or security issue, he is not likely to change his mind. A Captain of the Port order, by contrast, has the force of law. A Marine Safety Information Bulletin (MSIB) is policy but may refer to binding regulations. 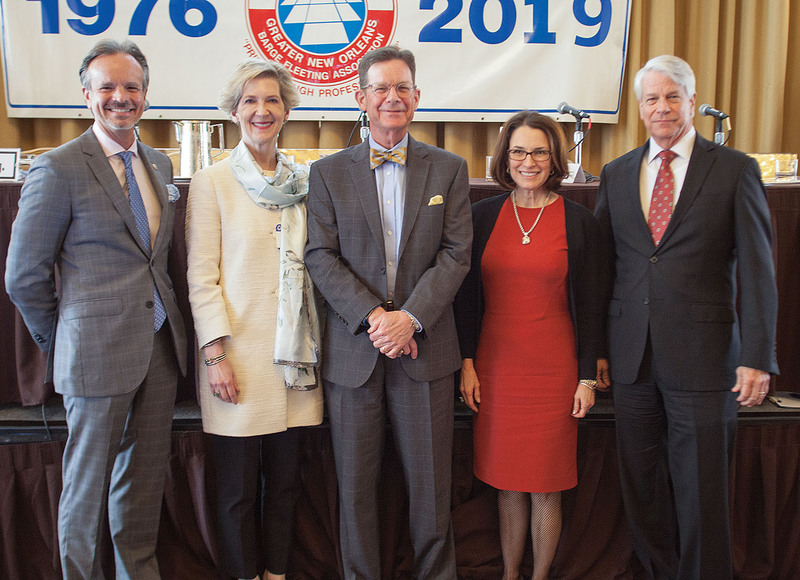 When Deloach noted that during the question period that although he has been a champion of safety management systems, he was questioning whether a Coast Guard inspection for Subchapter M compliance might not be preferable, Arguin answered, “To me, SMS is the way to go. It’s the difference between studying for the test every day and cramming the night before. Farley said the regulations he fears most for the barge industry come not from federal agencies but are unconstitutional state regulations that encroach on federal prerogatives. The next panel, on waterways construction and dredging projects, featured Col. Michael Clancy, the 63rd commander of the New Orleans Engineer District, and Sean Duffy, executive director the Big River Coalition, which has been advocating for years for a deepening of the Lower Mississippi River from Baton Rouge to 50 feet from its current 45 feet. Clancy noted that Louisiana is “by far” the premier maritime state by tonnage. 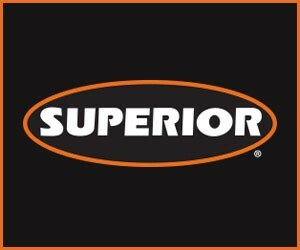 It includes 3,000 miles of federally authorized channels and 600 miles of deep-draft shoreline. Clancy spoke of the Corps’ “never-ending battle with Mississippi River silt,” even though most of the channel below Baton Rouge doesn’t have to be dredged to maintain a 45-foot depth. The curves self-scour, while the silt tends to collect on the straightaways. The Corps also daily inspects and manages 1,000 miles of levees along the Mississippi and Atchafalaya rivers. The Corps currently has seven dredges working in Southwest Pass. While 45 feet is the authorized depth, it’s more like 40 feet on some days. Some areas of the Lower Mississippi bottom are so changeable from day to day that the National Oceanic and Atmospheric Administration (NOAA) doesn’t even bother making charts of them. The New Orleans District just signed an agreement to deepen the Port of New Orleans itself, although there is no cost-benefit analysis yet and a feasibility study will take three years. The New Orleans District has been engaged in a flood fight for six months, with no end in sight, said Clancy. The current high-water period, which began in December, is already the longest in the history of record-keeping, and it has many more weeks to go. Although the Missouri River crest is due, Clancy noted that the Missouri River is only a minor contributor to flood levels in New Orleans, contributing “inches rather than feet.” The Ohio River is much more important, he said. Clancy said the area around the Calcasieu River is one of the nation’s fastest-growing areas due to the oil and gas boom. He said that the Corps has been authorized to replace the Inner Harbor Navigation Canal lock “if economically justified” since 1955, but the idea generates intense local opposition even though all local members of Congress in both parties favor the idea. A feasibility study is underway, and the chief’s report is due by December. The Corps has repurposed $58 million in its current Work Plan, but its advocates are asking Congress for an additional $100 million for dredging. The Mississippi River has an estimated $735.7 billion annual impact on the economy and supports between 2 and 4 million jobs between Cairo, Ill., and the Gulf. Duffy noted that the Lower Miss deepening project was twice submitted in previous Corps budgets but was removed during committee revisions. • to fund foreshore rock and wig dam repair in low river anomaly years. Duffy added that it would make economic sense for Louisiana to buy and maintain its own dredges. The next panel, on cybersecurity, addressed a topic that is being increasingly discussed in the maritime world. It included Capt. Kristi Luttrell, commander of Coast Guard Sector New Orleans; Roger Grimes, a cybersecurity consultant; risk expert Martin McCluney who works in the law firm Marsh’s cyber practice area; Kriss Bond, a cyber risk specialist at a London broker; and Stephen Viña, senior vice president at Marsh’s cyber practice in New York. Grimes, who calls himself a “data-driven defense evangelist,” has consulted for many companies but is currently at a security company called KnowBe4. For 14 years, he worked as a “penetration expert”—i.e., a hacker hired to break into companies’ systems so they can improve their defenses. He said it was so easy to do that it is very unusual for penetration experts to keep doing that job for more than three years because they get bored and move on. Grimes said that he advised companies to provide “the right defenses, in the right places, in the right amounts, against the right targets.” He said that while there are 1,000 steps companies can take to improve security, almost all risk is concentrated against just two of these causes, which he said are “social engineering” (i.e., employees opening the wrong email) and unpatched software. “In my 30-year career, only one threat was not the result of one of those two things,” said Grimes. But most companies spend only 1 to 4 percent of their security budget on those two threats that supply 99 percent of the problems. He said while security flaws in the programming language Java was the main threat for 11 years, for the past eight years the great majority of threats arrive by email because email threats are easy to do and can be automated. Infected emails are also known as “phishing” attacks, and part of his practice is to conduct simulated phishing attacks to test a company’s employees. About one-third to 40 percent of employees usually fall for them. Grimes noted that neither education nor expertise can fully protect against phishing attacks; he himself clicked on a fake phishing email sent by a boss of his that challenged some of his pet theories about cybersecurity. The only answer is to combine technical controls with “red flag” training of employees, and positive incentives work better than punitive ones for employees. Bond confirmed that phishing, including targeted “spear-phishing” emails that use knowledge about a particular target, are the No. 1 cyber threat. She noted that anyone can be targeted, even small companies that may not believe they are a worthwhile target. Viña said that no federal laws govern data breaches yet; instead, a patchwork of 50 state laws cover them. He noted that liability for loss of data is covered by cyber-insurance policies, while loss of money—including money loss due to cyber fraud—is covered by the part of the policy that covers crime. McCluney said that most hull policies are silent on cyber risks; that is, they don’t exclude it but don’t positively include it either. It’s often up to the underwriter whether to invoke “reservation of rights” in a cyber loss case. The panelists agreed that the Network and Information Security Directive (NIS) proposed in 2016 for the European Union is slowly becoming a de facto standard. The last panel, and one of GNOBFA’s most popular due to its point/counterpoint structure, was moderated by Maurice Hebert. It maintained a GNOBFA tradition of an open panel responding to a “hypothet” or hypothetical situation. The hypothet was a complicated river accident involving more than eight parties. 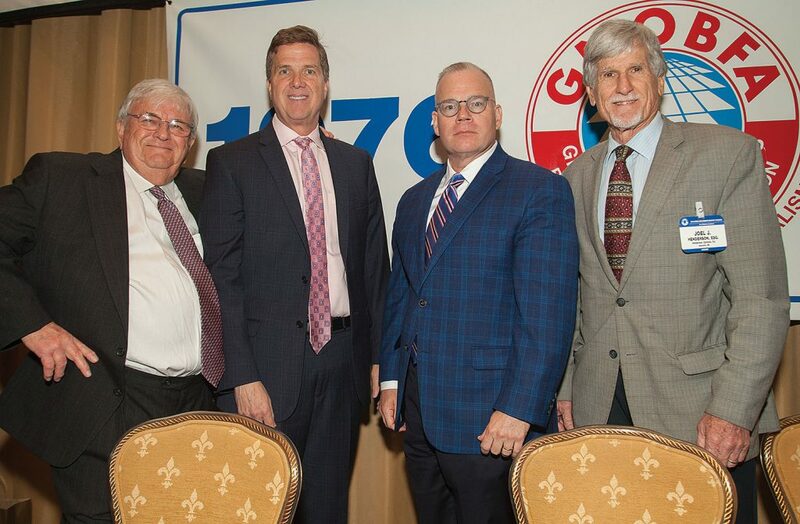 Panelists included Jeff Tillery, a partner with Jones Walker; Joel Henderson, senior member of Henderson Dantone; and Harold Flanagan, whose wide-ranging law practice includes maritime, oil and gas, and insurance recovery matters. The free-wheeling discussion, with extensive audience participation, ranged over seaworthiness, allocation of fault, injuries, degrees of negligence and joint and several liability. Among the many legal cases referenced was Batterson v. Dutra Group, which is currently before the Supreme Court. An adverse ruling could make punitive damages to plaintiffs available under the Jones Act, something that has never been the case previously. The panel and the audience enjoyed a lively and robust discussion on almost every point of the hypothet. Joel, Harold and Jeff battled with each other while the audience more than once disagreed with the panel. Maurice was able to change the direction of the discussion by interjecting “what if” scenarios. At the end of the discussion, there were perhaps more questions than answers, but for the audience, the only downside, said commenters, was that the panel ran out of time. Panel members promised more in 2020.